Cowabunga Dudes! Fil-Am develops “The Jellyfish” to harness sea waves for energy. The waves and tides have been looked upon as a source of clean energy. Even way back in 1979, Danish scientists and Israelis have experimented with wave driven generators. A Filipino-American seeks to be the first one to develop and build a wave driven generator with the Philippines as its main large scale ocean test-bed. 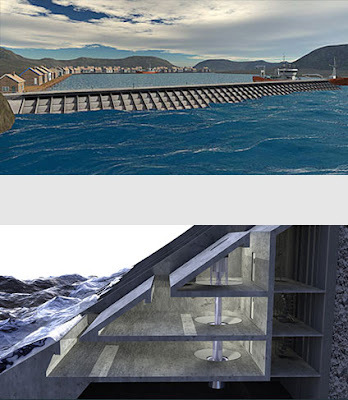 Ramuel Maramara based in Long Island, New York owns Brimes Industrial and has successfully designed a small wave energy generating device that converts waves into energy. The prototype is called The Jellyfish. The Jellyfish was successful in its trials and the challenge now is to upscale it so that it can generate 1 megawatt of electricity. Maramara plans to test it in the Philippines since the country is an archipelago with long coastlines and the potential for large scale use of the Jellyfish is very much present. “I guess it’s just natural for me to want to bring pride to our country. We are not boasting. We are just saying that we Filipinos can also do it. These things are not just for foreigners. We Filipinos are world-class builders, world-class engineers,” he said. “Right now, it’s a race. Australia has its own machine. The United Kingdom has its own machine. France has its own machine. Denmark, China, Japan, they have their own machines. It’s an international race for the one who can develop a device that is really efficient and at the right price. It has to be economically viable because you have to sell it,” he explained. Funding for the project has been applied with the Department of Science and Technology (DOST) so as to further develop the device and create a larger prototype. Since it is a form of renewable energy, First Gen Corporation has already committed its support for the large scale ocen energy generator.